Here is a look back at some of the photos that I took in 2014. I selected them for different reasons and the process of selection brought much reflection of the past year, which is always a good exercise. 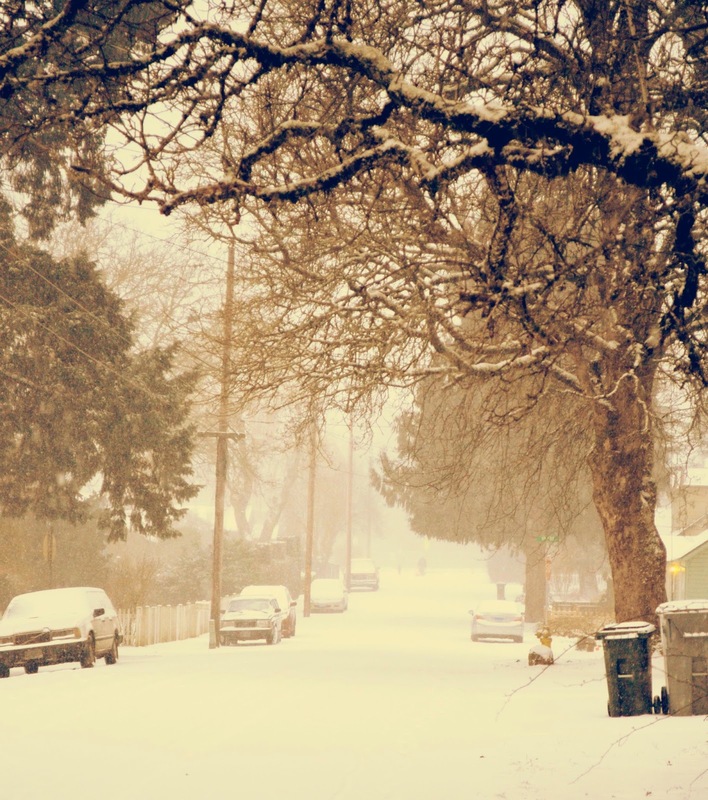 The winter of 2014 kept us on our toes with a large snow storm that blanketed the Pacific Northwest. Here is a picture that I took of my neighborhood, as the snowfall began. I remember thinking how quaint our little street looked, like something out of the 1950's. It was so quiet, I could hear the snow hit the ground. My son enjoyed the neighborhood park turned snow hill. I could barely peel him away at the end of each day. He was so happy 'catching air' and playing with all this neighborhood friends. 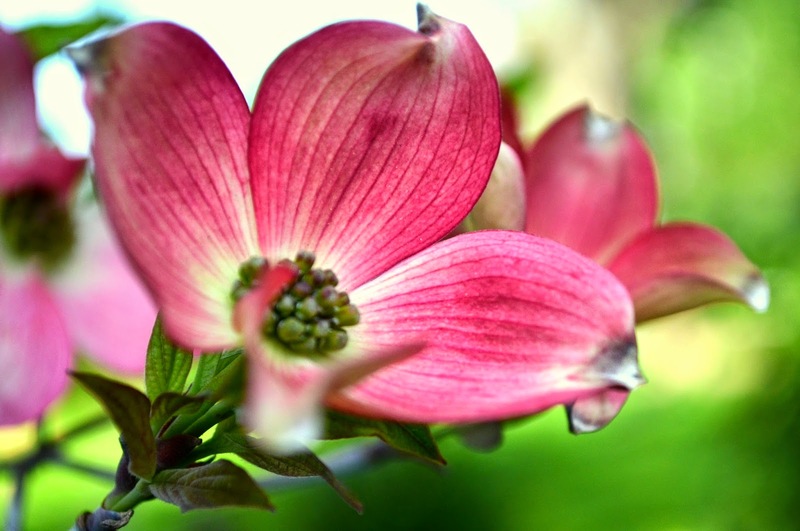 Spring arrived and I love capturing our old dogwood tree in bloom. It's around 80 years old. It doesn't have perfect shape, long damaged by other trees who dropped large limbs in years past. Nonetheless, we love this tree and treasure it. We lost this beautiful 80+ year old, Star Magnolia tree in mid-December due to the Douglas Fir tree behind it dropping a huge, forked branch that split the tree in two. Happy to have caught a few years of it in bloom, it was a magnificent show. 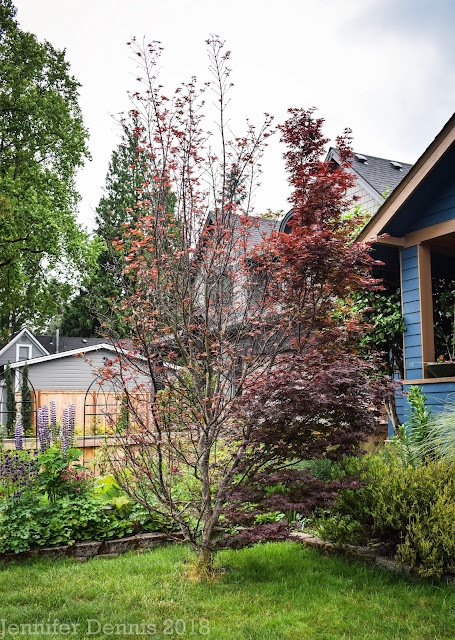 By and far the biggest project that we undertook as a family was a complete exterior remodel of our home. This old house was built by my husband's great grandfather in the 1920's. 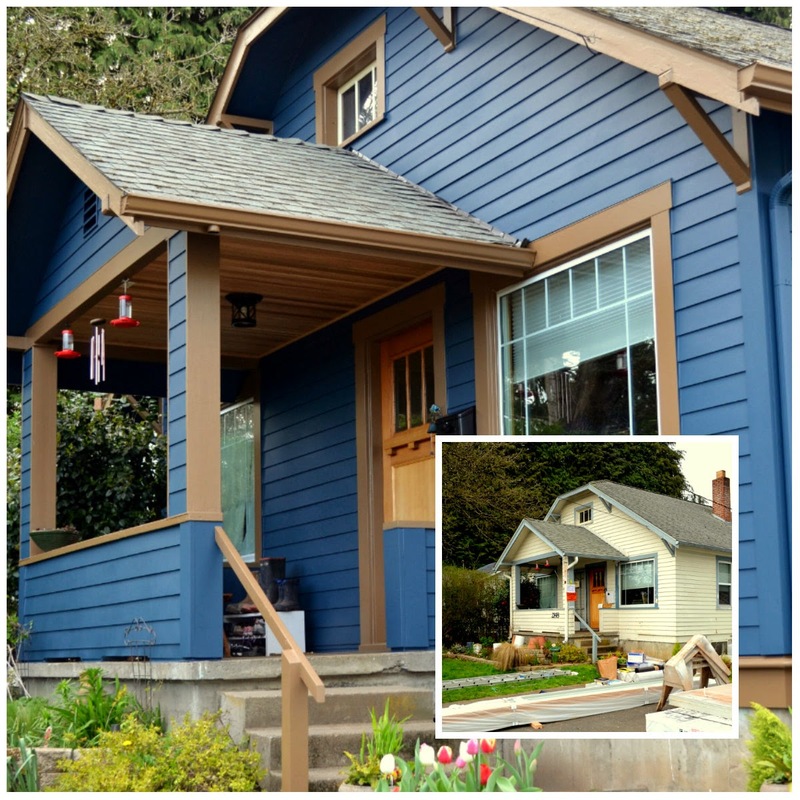 Nothing had really been done on the outside, save new windows, since the home was built. We could not have been more pleased with the end result. Another plant that seemed to disappear overnight was my pink lupine. It was there one day, then it was dead. I think some type of bug got at the roots. I loved this plant, as silly as that sounds, I carefully transplanted it from our prior home to our new home in 2012. I think I originally bought it in 2010. Serious bummer. I started several lupines from seed in the winter of 2014 and took those starts and planted them around in my gardens. 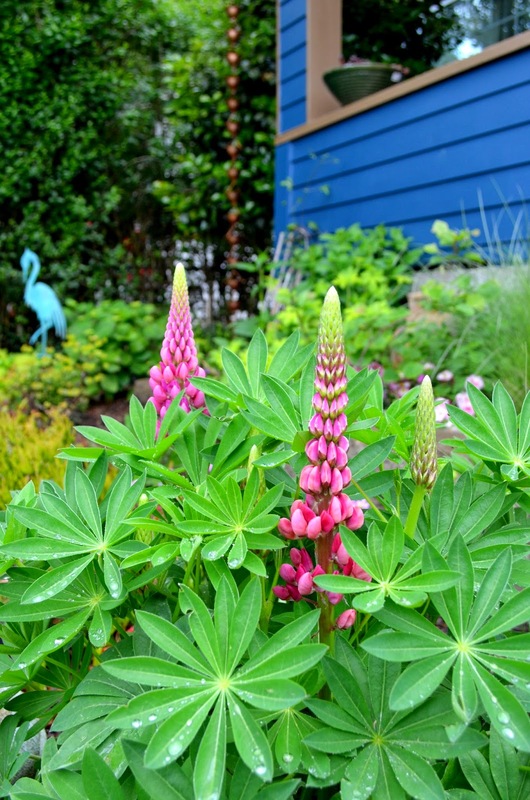 I just can't imagine a pacific northwest cottage garden without lupines. I won't know the colors until this spring. Something to look forward too. 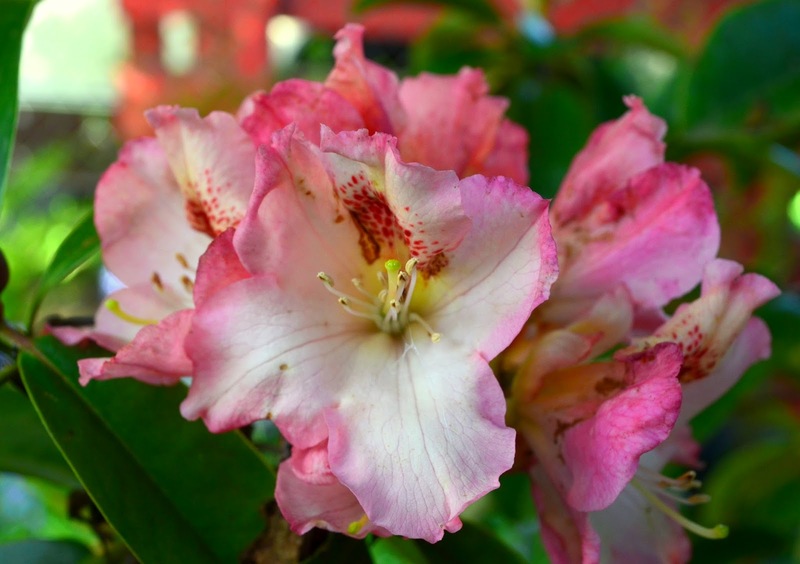 I tore out this pretty, coral pink, rhododendron. It was so pretty but all of the azaleas and rhododendrons in my gardens became inflected with lace bugs. I really enjoyed this particular rhody..another that I moved from the old house to the new one in 2012, but it was suffering as were all the azaleas and rhododendrons in the gardens. I pulled them all out. 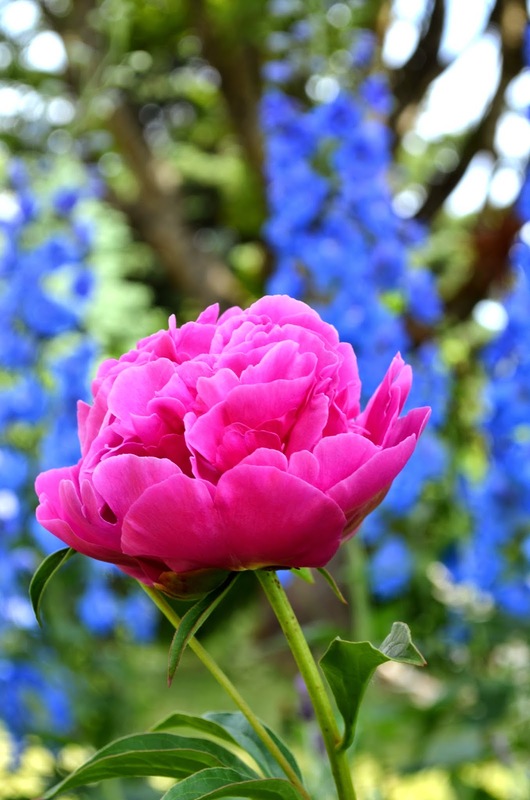 This old fashioned pink peony, edulis superba with the gallant blue spires of delphinium in the back drop was probably one of my favorite pictures of spring. The timing of their blooms was just perfect. The peony was given to me by a neighbor who didn't want it anymore and it had been in the gardens of her older home for decades. There is nothing quite like fragrant, heirloom peonies in spring. This favorite photo speaks for itself. 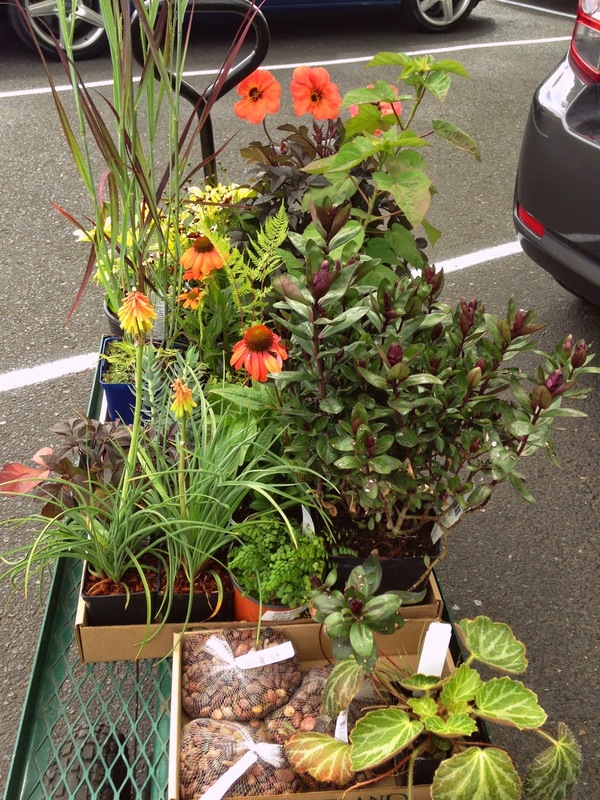 I mean really, what garden geek doesn't love plant shopping? I love getting gift cards to plant nurseries for my birthday! I enjoyed my visit to Swan Island Dahlia's in late August. So many beautiful blooms and such vivid colors. 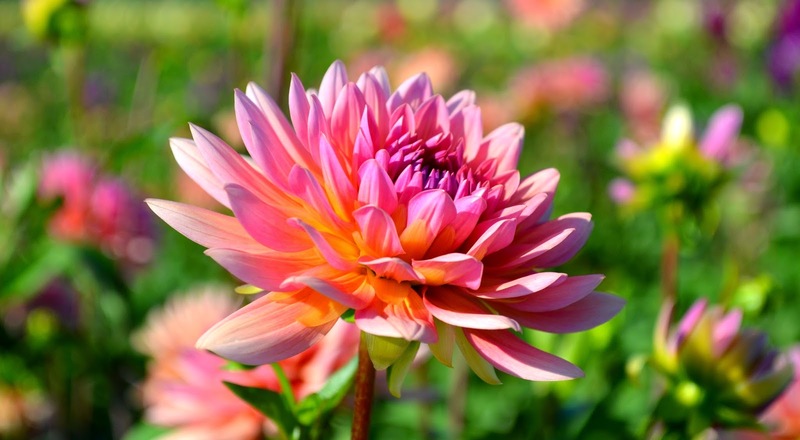 I have a few on my wish list as I think it's time I added dahlia's back into my gardens. The visit inspired me to make room for a 'cut flower' garden. 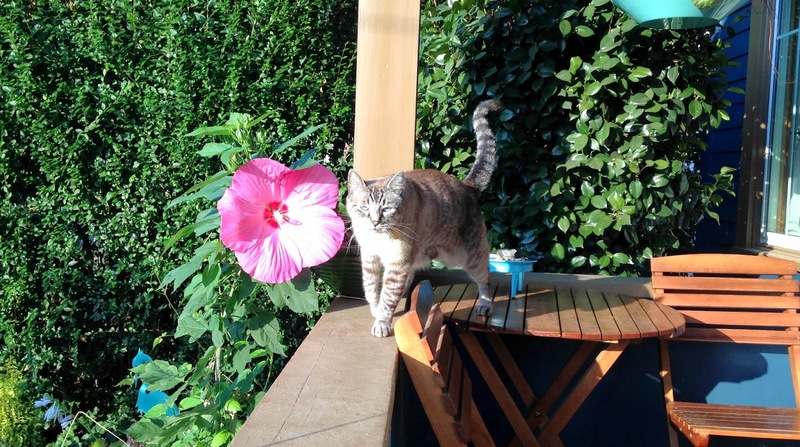 Silver cat demonstrates how big this extra large sized hardy hibiscus bloom was near our front porch. I was so proud that I got blooms as the plant was not in the 'perfect' location and I had to make extra sure that it was kept watered enough. It had so many blooms, maybe I got the spot right after all? My last photo to share was taken this fall, as the weather began to cool and I captured my favorite heather as its colors were changing into coral hues. Year-round interest. Yes. Wishing all my friends a very 'Happy New Year'! I'm excited to take on new gardening adventures and continue to grow as a plant loving photographer. Happy New Year, Jenni! I enjoyed seeing all those bright spring colors in your photos on this very cold first day of the year. It's great that Rusty is so enthusiastic. I love your shot of Rusty catching air. It's wonderful that he's so enthusiastic about the garden. 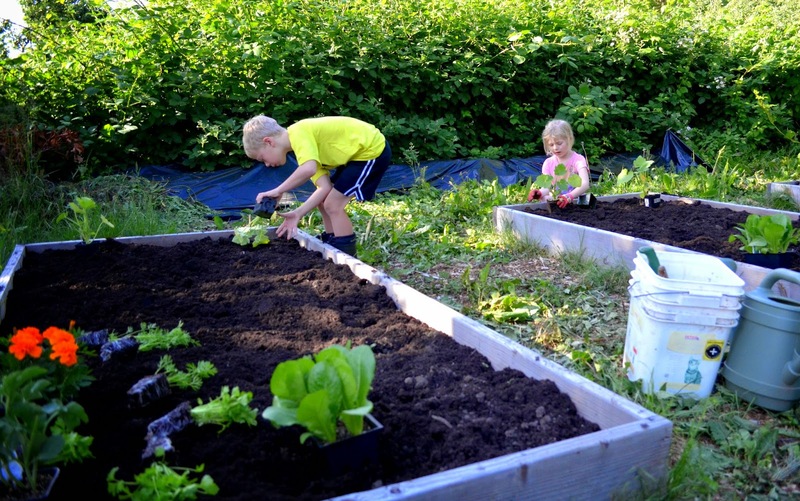 I enjoyed touring your garden this spring! And your heather shot is swoon worthy. Happy New Year, Jennifer! I can't wait for more garden projects to get finished and then have the gang back over again :) Happy New Year Laura! Beautimus photos, Jenni! Happy new year to you...here's to fab gardening in 2015 for you! Great pics! What a great way to sum up your year. Happy new year! OMG that hibiscus! Seriously insane. I'm still sad for you magnolia loss...hopefully there's a bright gardening year ahead for all of us! It must have been hard deciding which photos you liked best - or were most significant! 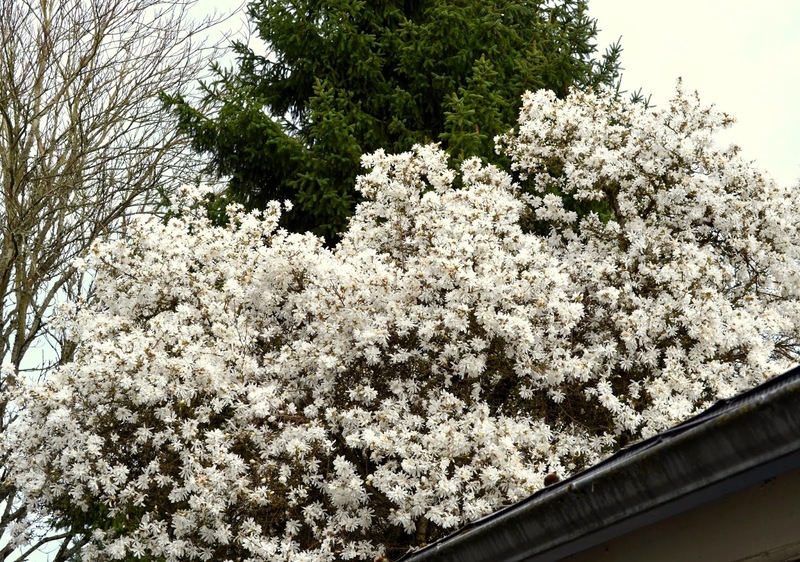 What a shame about the Magnolia tree. Is it gone completely - 100%, or have you managed to save a bit? BTW, I loved seeing on FB all the pics of your recent road trip, although it seemed inappropriate for me to comment on something so very family-orientated. We did a Fly-Drive tour of California, Colorado, Arizona etc (taking in the Grand Canyon) with our kids many years ago and we all loved it. Happy new Year to you, I don't think I could choose favourite photos,We want to use one to have a second acrylic print made but can' t choose, If there is some of the magnolia left it should reshoot, My sister has one that needed cutting back drastically and a couple of years on and it is back on form with lots of buds. Nice that you have a photographic record of the things you loved and lost...(as well, of course, as the things you keep and continue to love). Here's to much more sharing in the year to come. Excellent photos! I love the 2nd one down of sledding. Happy New year and hope 2015 is a productive and healthy year! These photos are wonderful! Our climates are so different. You have many plants that struggle in our heat/humidity. I would love to be able to grow lupines. That sledding pic is incredible! What a lovely "stroll" I enjoyed through your 2014 favorite photos! All are wonderful, Jenni. 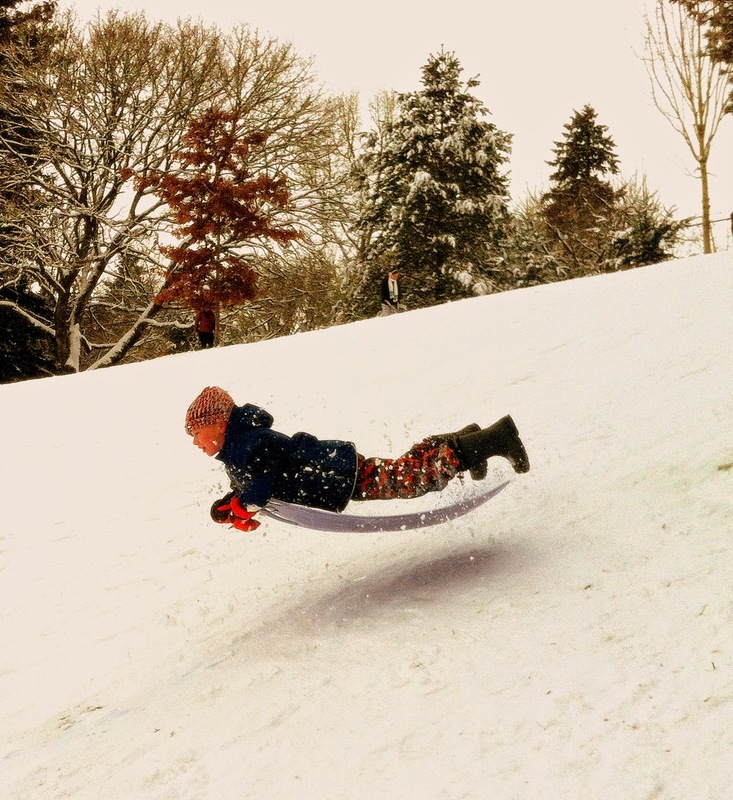 LOVE your sledding shot! 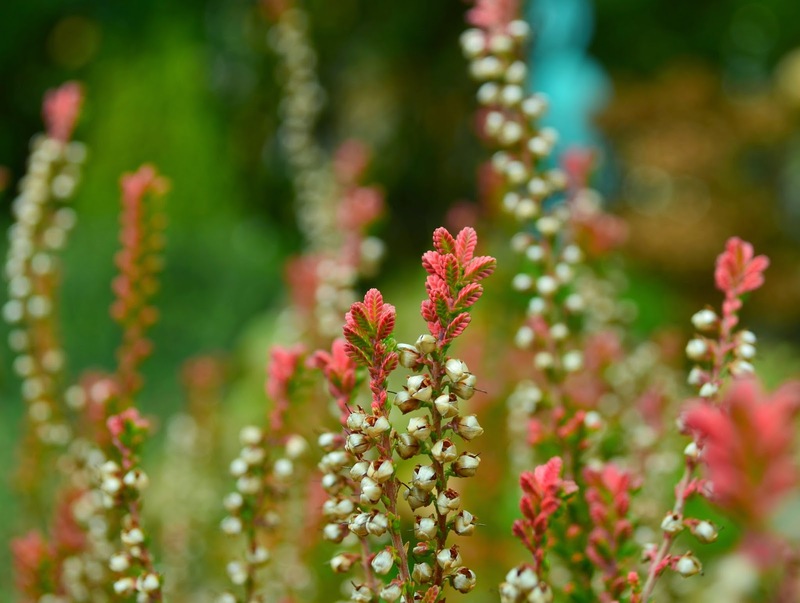 The calluna vulgaris is magical, too!